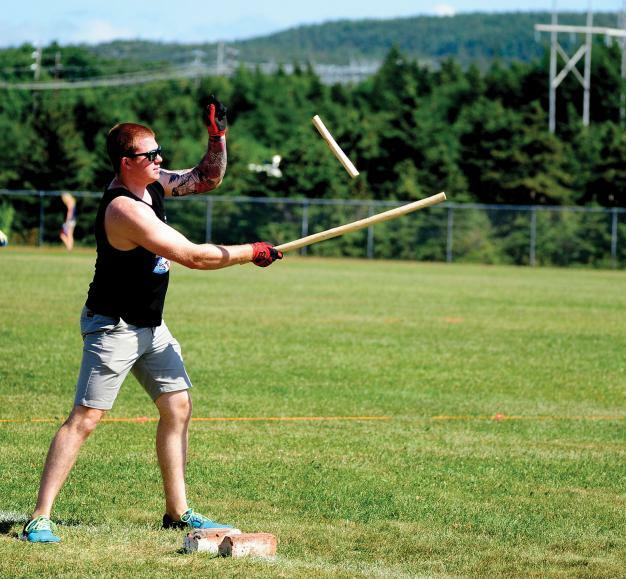 It started out as a typical outport childhood for Wallace (Wally) Collett. Growing up in the isolated (now abandoned) community of Harbour Buffett on Long Island in Placentia Bay in the 1940s, he recalls hours spent as a young lad spreading fish on flakes to dry, digging into Sunday dinners of corned beef and cabbage, and playing by the ocean. For him and others, excitement in the remote harbour was triggered by the arrival of the coastal boat. “Half the community would gather on the wharf that night, usually it was after supper, dark in the evenings, when the boat would come in,” remembers Wally, now 81, speaking over the phone from his home in New Brunswick. The coastal boat delivered vital supplies, mail and passengers. On one unforgettable occasion, the vessel brought with it a mystery that would confound Wally for much of his young life. Once a year, a trunk arrived for his family. It contained clothing of all styles and sizes, plus toys for the children. His Aunt Gladys Collett - beloved by Wally and his siblings - sent the gently used items from Montreal, where she worked for a wealthy family. “It was kind of like Christmas in the middle of the summer,” Wally fondly recalls. The most memorable of all the gifts he received from his aunt in this manner, he says, was his first teddy bear, which he proudly showed off around the tiny cove. For young Wally, the brash admission was understandably jarring, but not far-fetched. From a young age, he’d wondered why his parents and siblings (Holletts) didn’t share his last name (Collett) - a point that got him taunted at school. But could his cherished aunt really be his mother? Finding out wouldn’t be easy. “In those days it seemed that it was an accepted thing that a child is not told about his or her background,” says Wally. “No matter how many questions I asked, no answers were forthcoming.” As Wally got older, he grew more desperate to know the truth about his past. His own sleuthing eventually uncovered his biological father’s name (Ted Baker), which he found as a teenager on documents hidden in his family’s home. “I decided to keep it all inside me and somewhere, somehow, someday I would get to the bottom of it all,” says Wally. Years later, he finally did - and not a moment too soon. Wally left Newfoundland as a young man in the mid-1950s for a career with the RCMP. Training took him to Ottawa, near where his Aunt Gladys still lived in Montreal. During his many visits to see her, Gladys confirmed she was, in fact, his birth mother. Wally revelled in those opportunities to bond with her and learn all he could about his past. “[Those visits] were beautiful, they were emotional, because we really went back to the day I was born and talked about the whole thing,” says Wally. Upon his birth in 1937, Gladys was a young, unwed woman living in St. John’s, where his father, Ted, worked as a policeman, she told him. The couple parted for religious reasons (an all too familiar tale in those days in Newfoundland). Told by a priest that she must renounce her Protestant family before marrying Ted, a Catholic, she refused; the pair split before Wally was born. Gladys initially had a friend babysit her newborn son while she worked. When that was no longer an option, Gladys asked the hospital where Wally was born to care for him until she could make other arrangements. family in Harbour Buffett. Gladys’ newlywed sister, Susan Hollett, offered to raise him (though he was never formally adopted). With few options, and comforted that her son would be reared by family, Gladys agreed to keep his origins a secret. “I think she was always haunted by it,” says Wally. 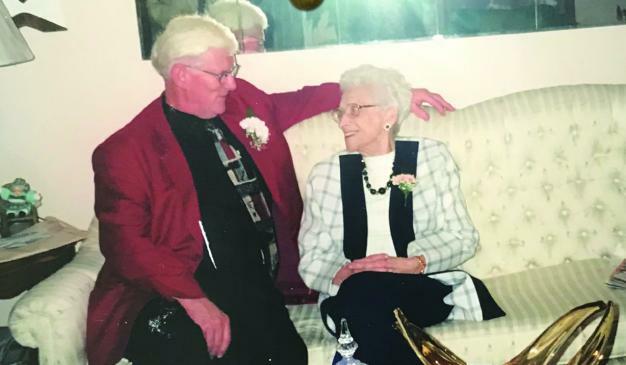 “One thing she told me, she said she had several opportunities to marry, and she said she promised herself she would never marry until I was settled down, I was married and had a home of my own,” says Wally. True to her word, six months after Wally was wed, Gladys finally tied the knot as well. Wally would remain her only natural-born son. Having finally established a relationship with his birth mother, Wally set his sights on finding his biological father. “I really got obsessed with it. I would spend nights on patrol in the police car and I would be thinking about it,” remembers Wally. Eventually he wrote the Chief of Police in St. John’s, hoping for any lead on Ted Baker, a former member of the Newfoundland Constabulary. “A short while later I got a reply, and in it was all the information I could ever have hoped for,” says Wally. The response included a current address for Ted in Philadelphia, USA. Wally nervously mailed a letter. He received a reply from his birth father within days. “The letter was very pleasant. He said, ‘I know who you are and I want to see you.’ I cried,” remembers Wally. Months later, Ted travelled to visit Wally in New Brunswick. “Even when I talk about it now I get all choked up,” says Wally, recalling the 10 days in 1963 that he spent getting to know the man who had fathered him. Sadly, within a year of their meeting, Ted passed away. Wally attended his funeral in Philadelphia, where he met Ted’s siblings and children. Suddenly, Wally’s already large family became even larger, with the addition of several aunts, an uncle and siblings. Shortly after Ted passed, Wally and his wife had their third son, whom they named Christopher Baker Collett in honour of his birth father. Wally keeps in contact with that branch of his family, and in recent years he paid a visit to Ted’s birthplace, Conception Harbour, NL. “I found the old family homestead, where he was brought up. The house is not there; it was left abandoned and fell down. I walked through the area and I found the remnants of an old wood and coal stove. I picked up one of those round cast-iron covers off the stove, and I brought it back to New Brunswick with me,” says Wally. He’s since painted a scene on the piece, which he displays in his home in a nod to his roots. Fortunately, Wally had more time to bond with his birth mother, who lived to be 88. He eventually made arrangements for Gladys to live near him in New Brunswick, where he could care for her in her final years. “I was so very, very blessed to have had the chance to do that for her, especially since she was not able to really care for me in my growing up years,” says Wally. She passed away in 2003, and Wally - who eventually retired from policing and became an ordained minister - gave the sermon at her funeral. As he looks back on the long and interesting life he’s led so far, Wally holds no grudges for the secrets that were kept. He is, however, full of gratitude for having had the chance to connect with each of his birth parents in a meaningful way, and for the Holletts, who took him in and raised him as one of their own. 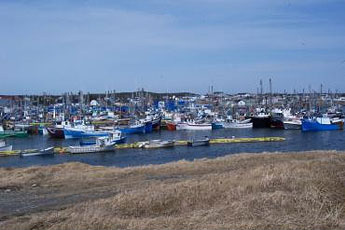 Helen Young of Port Dover, Ontario wrote to Downhome about her trip to Bonavista Bay, Newfoundland. In July 2003, we planned two nights' stay in Catalina, Newfoundland, about midway between Trinity and Bonavista. Our hostess was Sheila Hart, who wasn't sure she would open her B&B that summer as she had a new baby. We were glad she consented to take us in; she really made us feel at home. Our first stop was the Trinity Loop train ride. Two Women's Institute members made us feel very welcome at their craft shop in Port Union as we browsed through their wide variety of handmade crafts. We drove on to the Bonavista lighthouse and later went to see the replica of Cabot's ship, the Matthew, before photographing another breathtaking sunset. Next morning, we headed out early after breakfast to spend the whole day in the historic town of Trinity. We decided to purchase tickets to visit the six historical sites in Trinity, rather than take the 10:00 a.m. walking tour. Several of the premises had interpreters who gave us a fine description of each building. We barely had time to eat our picnic lunch in the little park in the centre of town before the Trinity pageant began. Many tourists joined us for this three-hour presentation in story and song. 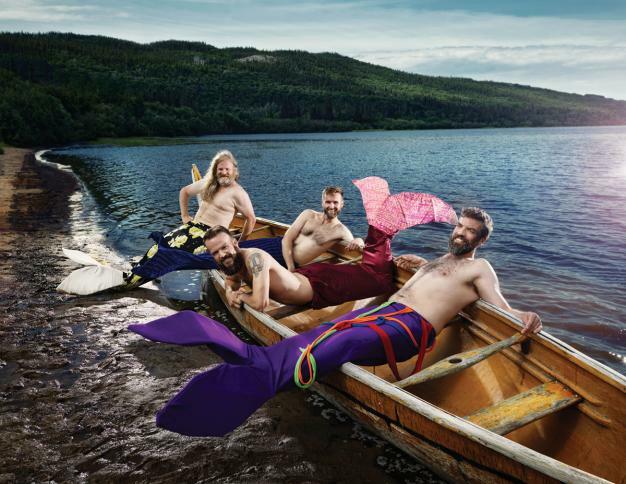 Together we travelled to various venues around town on a magical journey following the story of sailing and sadness, tears and laughter, the story of "The New Founde Land" that spans two centuries. We had pre-ordered tickets to the dinner theatre presented at the new Rising Tide theatre at 5:30 p.m. Great roast beef dinner and wonderful singing and entertainment was enjoyed, including a band of mummers. The day was completed as we returned to the theatre to see the play As Loved Our Fathers, the story of a family torn between voting for or against Confederation with Canada. The fog was dense for our drive back to Catalina, but we were fortunate to be able to follow three other cars, whose drivers were much more familiar with the road. One of Elliston's famous root cellars Sunday morning, we headed for Elliston to view many of the 135 root cellars there, and join in the final day of the Bird Island Puffin Festival. We took the short road to Coles Gulch and watched as whales jumped in Trinity Bay. We returned to the festival grounds by noon, as we didn't want to miss the Jiggs' dinner being prepared and served to the awaiting crowd. We enjoyed the live gospel music and conversation with those who sat near us. Unfortunately our time was too short, and the trip was over too soon. Us East Coasters have at least three things in common: we donât sweat the small stuff, weâre bursting with innovative ideas and - as evidenced by these photos - we definitely arenât particular. Take the "Quality frying pan," pictured above. For her trip to Lodge Bay, Labrador, reader Carol Parsons of Athabasca, Alberta remembered to pack everything but the frying pan. Thankfully, her sweet tooth saved the day. 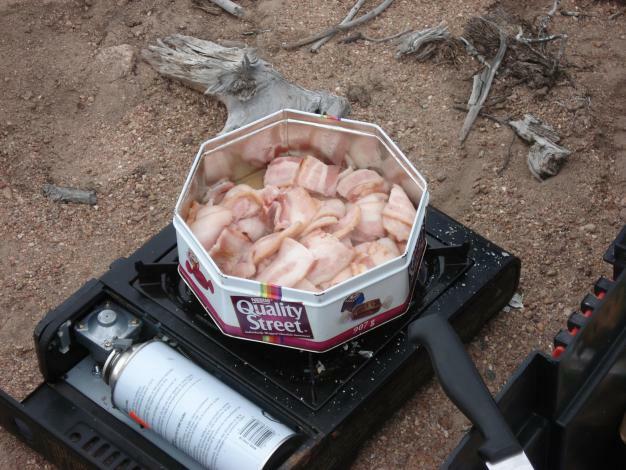 Turns out the candy tin was the perfect substitute - and made extra tasty bacon. Here are five more clever ideas that might just help you out of a jam during your May 2-4 adventures. When Safron Bennett of Wabush, Labrador misplaced her corkscrew during a boil-up, she wasnât long coming up with a few everyday tools to create the perfect alternative.Where Thereâs Wine, Thereâs a WayJeremiah Osmond and his daughter Pamela Hardy were getting a little bored while staying at the cabin - but a couple of milk crates, a piece of 2x4 and a pinch of creativity combined to make a see-saw, the perfect boredom buster. (Photo submitted by Jerrie George of Mount Pearl, N.L. )Instant PlaygroundGood for clearing a spot for a boilup - and for frying up a meal of caribou sausage - Todd Lilly of Wabush, Labrador is getting his moneyâs worth out of this winter shovel. (Photo submitted by Linda Lilly. )Non-Sticky SituationIn the midst of cooking a feed of fish and brewis while camping, Tammy Head of Wingâs Point, Newfoundland substituted a beer bottle for the potato masher she accidentally left at home.Spud SmasherWithout a microwave or bottle warmer, mom Trina Clarke of Durrell, Newfoundland dunked her babyâs bottle right into the boil-up kettle! âAnd yes, food or formula does taste much better in the great outdoors!â she confirms.The Mother of InventionWhat spur-of-the-moment inventions have you rigged up while enjoying life in the great outdoors? Submit your photos on our website.